The Golden Arrowhead, as Guyana’s flag is known, was adopted in 1966 after the country became independent from the United Kingdom. It was designed by American vexillologist Whitney Smith. 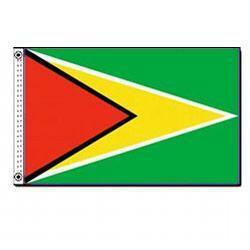 The red in this flag symbolizes for zeal and dynamism, the green represents agriculture and forests, and the gold represents Guyana’s mineral deposits. The black and white fimbriations were not part of the original design. The black stands for endurance while the white represents water and rivers.